Convert FLAC to MP3, AAC or more? mediAvatar FLAC Converter solves your problem by converting FLAC to most popular audio formats including WAV lossless, WMA lossless, AAC, AC3, AIFF, APE, AU, , M4A, MP2, MP3, OGG, RA, WAV, and WMA. This FLAC converter also makes it easy to convert FLAC audios for playing on iPad, iPod, iPhone and PSP players that you can directly transfer the output music to those players after the FLAC conversion. mediAvatar FLAC Converter allows you to pick a segment from the source FLAC files to convert and edit the music effects like fade-in, fade-out, volume normalize, etc. 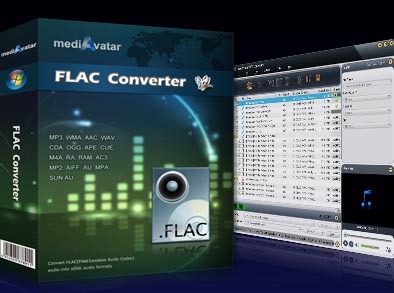 Download mediAvatar FLAC Converter demo version for free now. Start converting FLAC to popular audios with the simplest steps. Convert FLAC lossless music to other popular audio formats including AAC, AC3, AIFF, APE, AU, , M4A, MP2, MP3, OGG, RA, WAV, WMA, WAV lossless, WMA lossless, e.g. convert FLAC to MP3. Set many audio formats for the same FLAC music file for converting at one time, making it available on different mobile or PC's media players. Listen to FLAC music on your iPad, iPod, iPhone or PSP by simply converting and transferring FLAC music files to audio formats they supported within this FLAC converter. The support for multi-core CPU processing, multi-threading and batch processing ensures high speed while converting FLAC to audio formats. This FLAC converter provides the possibilities of adding or adjusting sound effects including fade-in, fade-out, volume normalize, band pass, chorus, flanger, echo and speed. Any segment from your FLAC music can be easily extracted and converted to any supported audio format. Split and convert a large FLAC file into several files, you just need to choose a appropriate split duration/size before converting. If applying sound effects is not enough to customize your music files, you can also make any change to the output audio parameters including editing ID3 tag info. Ability to auto exit application, shut down, hibernate, stand by system, or do nothing after the FLAC to audio conversions are complete.